Firstly, I would like to apologize to Nola's mommy for not sharing this information any sooner. She was very nice to spend this extra effort in creating this mail. Not only will you learn about Dachshunds but you'll also get to find out more about Nola- Bloggerville's famous friend for all seasons. 1. Dachshunds come in 3 sizes: Standard (16-35lb), Miniature (under 11lbs, Nola is a mini at 8lb) and the unofficial ''Tweenie" which is too big for a mini and to small for a standard (12-15lb, Boston is a Tweenie). 2. Dachshunds come in more colors and patterns then any other breed recognized by the AKC(American Kennel Club)! There are Red, Black and Tan, Cream (called wheaten in wirehairs, true creams are very rare), Chocolate and Tan, Chocolate, Chocolate and Cream, Black and Cream, Blue, Blue and Tan, Isabella, Isabella and Tan and Wild Boar. It's dizzying, but there's still more! 3. Patterns: Dapple, Piebald, Double Dapple, Brindle and Sable. I came across the term Dapple in Nola's blog and asked about it. Here's the response and further explanation on the topic. Dapple can come in any Dachshund color. So let's talk about Boston. Boston is a red Dachs, with dapple as her pattern. Dapple is when the base color (in this case red) have splotches of dark or lighter color all over it, and most of the time either completely blue eyes or partially blue eyes. Double Dapple is when 2 dapple Dachs are bred together, resulting in dapple with large areas of white. It sounds pretty, but you never want to breed to dapples together, as the puppies have a 1 in 3 chance of being born blind, deaf, eyeless or deformed. Sable Dachshunds like Nola are very rare, the only rare Dach color. Sable are almost exclusively in longhairs, which is why finding out Nola's color what such an issue. She was born nearly black, then lightened to almost red by 12 weeks. But she has continued to darken to the color she is today, and has always displayed a widows peak the hallmark or Sables. 4. Difference between Male and Female Dachshunds: The males seem to be a bit dimmer, and more tolerant. The females are very very smart and protective, and incredibly in tune with their people. They're also more prone to separation anxiety. To learn more about Dachshund colors, Nola's Mommy even provided us with some references. Lastly, here's one of their best post for the year 2011. This a detailed account of Boston's labor. It's interesting that dachies come in so many colours. I wonder how many are actually recognised/permissible for showing? I actually have no idea yet. But I'm pretty sure Nola's Mommy does. I thought I could edit my reply. Anyway, here's the response to your question. thanks fur introducing us to Nola. she's furry cute! and fur stopping by my bloggie too! Nola is a great person. She visit everybody and checks how they are. You're welcome and like you, I'm also guilty of not paying attention to their color. I also thought Nola was red because I didn't notice that she had some black hairs on her fur. Very interesting info on dachshunds. We love reading Nola's blog, too! Yes, it's not a surprise. We all love Nola's blog because she does the cutest things. Now she's learned a new trick in two days. Cool, eh? She's definitely one smart doggy. Just see those camera eyes. Her pictures are pretty and you can't just get those from a dog who doesn't know how to focus properly. I had no idea they came in three sizes! 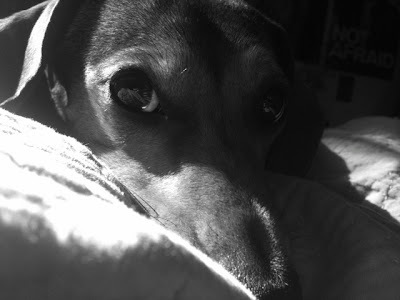 There are so many great doxie blogs! Yes, they also come in a multitude of colors and patters. The sizes are easy enough to memorize but the fur combinations, only dog experts and dachshund lovers can recall those by heart. I have a friend who has a dachsy. They make great companions! Is Austin friendly to dogs? I bet Austin would make you cuddle him if you got a pet that wanted to be petted. Thanks for posting this info Haopee! I'm happy to help any way possible, and truly enjoy educating people about Dachs. Interesting. Yes I did respond but unfortunately I've read this after sending her my reply. Thankfully there's the magic of editing. And you're welcome. This was your work and I'm glad to share it with everyone because we know you and can relate better. I never realized doxies were so varied. Very informative, we just adore the tweenie version, what an adorable name!! You should visit her. She's really friendly and oh-so-cute. I'm sure with Sampson so big and Nola so small, I bet it would be pretty scary to have them living in one house. Wow! Never knew there were so many different kinds of dachsunds! Thanks for sharing! Oh darn, I haven't met Chloe yet. LOL. Yes. There's a dachshunds for everybody. Thank you for all that great info on Dachshunds! I never knew they came in so many sizes and colors! Red? Really? WOW! Ofcourse, I love Nola and have many other dachshund furiends. Great info! Thank you thank you! Hey Scrappy. How are you and your cutie face? Yes Nola is one of the most lovable dachshunds in bloggerville. You're welcome. They come in so many patters and color that you'll head will have a headache incase you choose to memorize them. We have lots of dachshunds that come to visit us at the Day Care. They all have really fun personalities too. We learned a lot on this post that My Vickie will use for sure. As for you question about getting a notice on the music, Yes, we get them all the time, but if you read thru it you find that generally "No Action on your part is required"
One time, usually with John Denver music, it tells you that the music will NOT be played in Germany. You Tube takes care of the legallity. So far, everything has been ok.
Firstly, I'm glad to hear that Allred is no longer missing. Actually it's quite fine but unfortunately for those who've made their own music for their video it's considered harassment. That's awesome. I'm interested in your day care. What do you guys do their? Do all of them bring packed lunches?